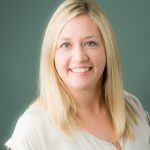 Tonya Carey has been with Oregon Reproductive Medicine since 2015. She connects women from all around the country with our egg donor program. As an egg donor, there are several key pieces of information we need in order to determine if you will be able to move forward in the screening process. While some of these are in the form of blood work, ultrasounds, and physical exams, the most daunting and time-consuming thing asked of you will be to complete our Egg Donor Application. While all the pieces of information we will gather during the screening and application process are extremely important, the egg donor application serves two key purposes. Of course, the majority of the information asked in our application is to determine if you are the right fit for our program. Secondly, some of the information you enter will create your donor profile, which will be viewable to intended parents when they are ready to choose their egg donor. Let us go over each section of the application, what it entails, how it is used, and what to expect. After the initial information is given, you are then directed to another page to start completing the first tab, “Application.” In this section, you are asked to upload one photo and answer some basic screening questions. Things such as contact information, physical characteristics, education, occupation, egg donation experience, general health history, and reproductive health history are covered in this section. Most of the questions asked in “Application” are ones you should know by memory, and not much research is normally done during this step. Once you have submitted this section, it will be reviewed to determine if you are qualified to move forward. We may have some additional questions regarding your answers, and if that is the case we will reach out to you to gather that information. If all looks well, you will be invited to attend an Egg Donor Welcome Webinar via phone, computer, or tablet for more information on our program and donor expectations going forward. Once you have completed the Egg Donor Welcome Webinar, you will be scheduled for your baseline (fertility screening) appointment. At that time we will also open up the second section of the online application titled “Family Health History” (Why Your Family Health History Matters). This will be the most time consuming, yet most important part of the application you will need to complete. This section will start with basic information regarding your family and later ask for characteristics for your immediate family. At the bottom of the page will be a long list of ailments, and you will be asked to select any family members who suffer from these ailments along with the age at which they were diagnosed and their treatment. We do want you to reach out to both sides of your family to gather this information. It is extremely important to input as much information as you can find. Later on, during a phone consult with one of our Genetic Counselors, this information will be reviewed with you and then used to create a document that outlines risk factors of passing down certain conditions. You may be asked by our Intake Specialist or the Genetics Counselor to gather a bit more information. Don’t be discouraged! This information is not only important for the intended parents to have, but it is also great information for you to know about yourself and your family’s health history! After you have completed your Genetics Consult and your Family Health History section has been approved, you are then able to move forward to the third section of the application titled “Profile.” This section will include questions which require an essay type answer, and you’ll also be asked to upload additional photos. 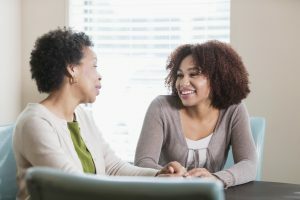 Keep in mind when completing this section that the information you enter will be how the intended parent’s “get to know you.” The more you elaborate and tell about yourself, the more it helps with the matching process (Tips for Getting Matched). This is also when you’ll upload photos of yourself throughout your childhood, teenage years, and as an adult. Try to stay away from the selfies, and include photos of you doing things you enjoy like, snowboarding, fishing, playing an instrument, etc. Before your profile goes “live” for intended parents to see, we will do a review of the information you put into this section for grammatical errors and to ensure it does not contain any identifying information. If there is not much added to this section, you may be asked to elaborate a little further on certain questions and possibly provide more photos. Being thorough upfront will help get your profile active much faster. It is important to know that various components throughout the other sections will also be viewable to intended parents, not just the Profile section. The Profile section does constitute quite a bit of the application, however, intended parents are also able to see some of your basic characteristics along with the Family Health History section. Please know that we do keep some of the more private questions that are asked of you shielded from public view. These questions are important but only needed for screening purposes. Congratulations! At this point your application is complete and you are almost ready to become an active donor. One thing to keep in mind is that the information in your application can always be updated. Any information added to the Family Health History section must be reviewed by our team first to ensure it is nothing that would disqualify you from the program, however, you are always able to update your essay questions and add or edit photos if you’d like. If you feel it is taking a bit longer to get matched, we may also suggest you do this as well. Please know that we are always here to answer any questions you may have and help you through the process! 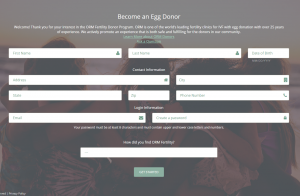 If you are just starting your research into egg donation and would like to learn more, please do not hesitate to connect with us!